Cosmetic Acupuncture or Facial Rejuvenation Acupuncture as it is also known is a safe and painless, non-surgical method of reducing the signs of aging. Though Facial Rejuvenation Acupuncture can sometimes be referred to as an Acupuncture Facelift or Cosmetic Acupuncture, it is more than a cosmetic procedure. It is a rejuvenation and revitalization process designed to help the whole body look and feel younger. There are two aspects to the benefits of Facial Rejuvenation Acupuncture. One is the benefit of ‘local’ treatment and one is the benefit of ‘root’ treatment. Local treatment directly addresses facial aging symptoms while root treatment treats the underlying cause of facial symptoms such as hormonal balance, digestive problems or emotional stress. Both local and root treatments are performed in each session to provide the best and the longest lasting benefits. Facial Rejuvenation Acupuncture may erase as many as 5 to 15 years from the face, with results apparent after a course of treatments. Fine lines may be eliminated and wrinkles diminished. 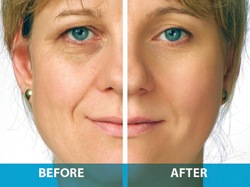 Bags under the eyes can be reduced, jowls firmed, puffiness eliminated, droopy eyelids lifted and double chins minimized. Other likely results include: moisturizing of the skin with increased local circulation of blood and lymph to the face; increased collagen production, muscle tone, and dermal contraction; tightening of the pores; brightening of the eyes; improvement of hormonal balance to help acne and the reduction of stress. This brings out the innate beauty and radiance of an individual. While it does not produce the dramatic results of some of invasive procedures, it does help the face look younger, healthier and more radiant without dangerous side effects. Facial acupuncture is much more effective than facial massage alone. A 1996 report in the International Journal of Clinical Acupuncture reported that among 300 cases treated with Facial Acupuncture, 90% had marked effects with one course of treatment. These effects included: the skin becoming delicate and fair, improvement of the elasticity of facial muscles and leveling of wrinkles, a ruddier complexion, and overall rejuvenation not confined to the face. Since the body/mind/spirit are all connected, negative emotions reflect in the face and change the appearance of skin texture, color and tension. Acupuncture can eliminate stress and bring out innate strength, vitality and health. You will not only look younger but also most certainly feel younger. While not a replacement for surgery, Acupuncture Facial Rejuvenation is an excellent alternative. It is far less costly than cosmetic surgery and is safe, virtually painless, has no side effects or risk of disfigurement. Unlike surgery that may have an extended recovery period with swelling and discoloration, there is no trauma from Facial Rejuvenation Acupuncture. While Facial Rejuvenation Acupuncture cannot reshape one's nose or chin, it is a more subtle rejuvenation that takes years off one's face safely and naturally while improving overall health. What is the course of treatment and cost of a session? Some results may be seen as early as the 2nd or the 3rd session but the effects become most noticeable and lasting on or about the 7th or 8th session. In some exceptionally difficult cases, the course of treatment may need to be repeated again. As in surgical facelifts, the actual outcome and how long the effects will last cannot be predicted. Each person responds differently, depending on his or her age, condition and lifestyle prior to treatment. For this reason, results for some may be more or less dramatic than they are for others. Following the initial course of treatment, monthly maintenance sessions can prolong the results for 5 to 10 years. The benefits of a monthly maintenance program are not limited to the face, but rather, improve the body’s overall health and vitality. This, in itself, slows down the aging process. Cost of Treatment: First treatment which includes a health check up is $170. Continuing treatments are $105 per session. Any underlying health concerns will be treated in parallel during your sessions. 1. Cosmetic acupuncture increases the circulation in your skin. Your circulation tends to get a little sluggish as you age. Cosmetic acupuncture brings all those nutrient goodies like collagen and elastin back to where you want it—in your face and neck. 3. It’s safe. No side effects here, other than the occasional bruise, which heals in less than a week. You don’t have to worry about scarring, lumps, or botched procedures. 4. Your health benefits from the sessions, too. During a cosmetic acupuncture treatment, your acupuncturist also treats any health concerns that you have. They do this because beautiful skin is linked to good health. You can’t have beautiful, glowing skin if you’re health is suffering. 5. Cosmetic acupuncture is effective in treating acne, eczema, and rosacea. 6. It’s relaxing. It may seem unlikely that an acupuncture treatment is relaxing, but the truth is that acupuncture increases the release of endorphins, those feel-good chemicals in your brain. This means that from the time you’re on the table for hours, and sometime days after your treatment, you’ll feel mellow, rested, and less stressed. 7. Cosmetic acupuncture is chemical-free. There are no acid peels, Botox, or injectable fillers involved in the process. 8. You’ll spend less money on cosmetic acupuncture than if you go the plastic surgery or injectable route. Each acupuncture treatment costs about $100 to $150 compared to several hundred or even thousands of dollars for injectables or surgery. 9. The effects of cosmetic acupuncture can last years with just minor tune ups every six months or so. 10. There is no down time with cosmetic acupuncture. You can have a treatment at lunch and head back to work glowing and relaxed.